WARNING - possible triggers for people with eating disorders as weight loss is mention and numbers are mentioned. My daughter has given me permission to share this with you. 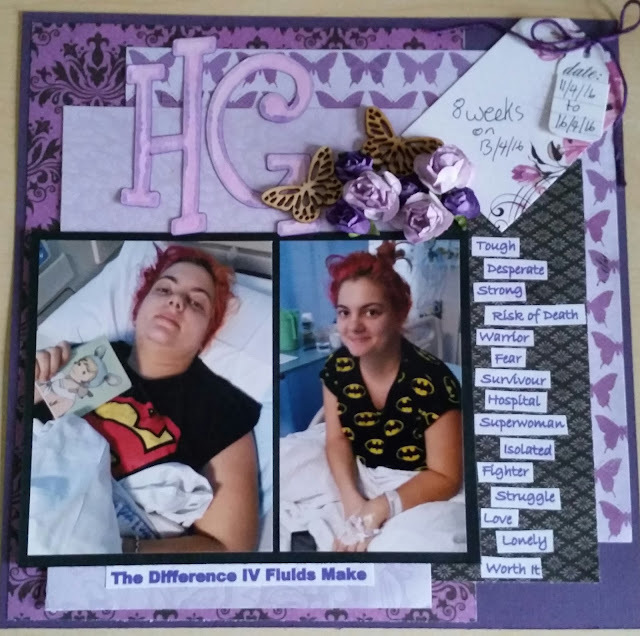 When I saw the theme of the Aussie Crafters June Challenge (Mum), I knew exactly what I wanted to scrapbook - my daughter's pregnancy journey and her struggle with Hyperemisis Gravidarum (HG) but only one layout was needed for the Challenge so I focused on her first hospital admission. Unfortunately something went wrong with both hard drives that I store photos on and 6 weeks of photos were missing when I went to get photos printed, which included these photos so I had to wait to get new copies or find a copy stored in another location so by the time I had photos printed for this layout and was able to start work on it the finishing date had passed. I felt it was important to complete the layout and share it still though. The Awareness logo for HG incorporates a butterfly so I knew I wanted to use butterflies in all her pregnancy layouts. Purple is also her favourite colour so will also feature in the album. I loved that she was wearing a Superhero shirt in both photos as women who endure HG really are Superheros, so I decided I wanted some black in the layout to draw your attention to her. So I chose to use an old Kaisercraft range - Violet Crush, butterflies from my stash and some paper roses. I decided to go with a 8x8 layout as I felt this would be a good album size for a pregnancy album. Apologies for the poor quality of the photo, at this stage I was still using a 6 year old phone after my phone became a paperweight due to a fatal glitch when I downloaded a popular app. 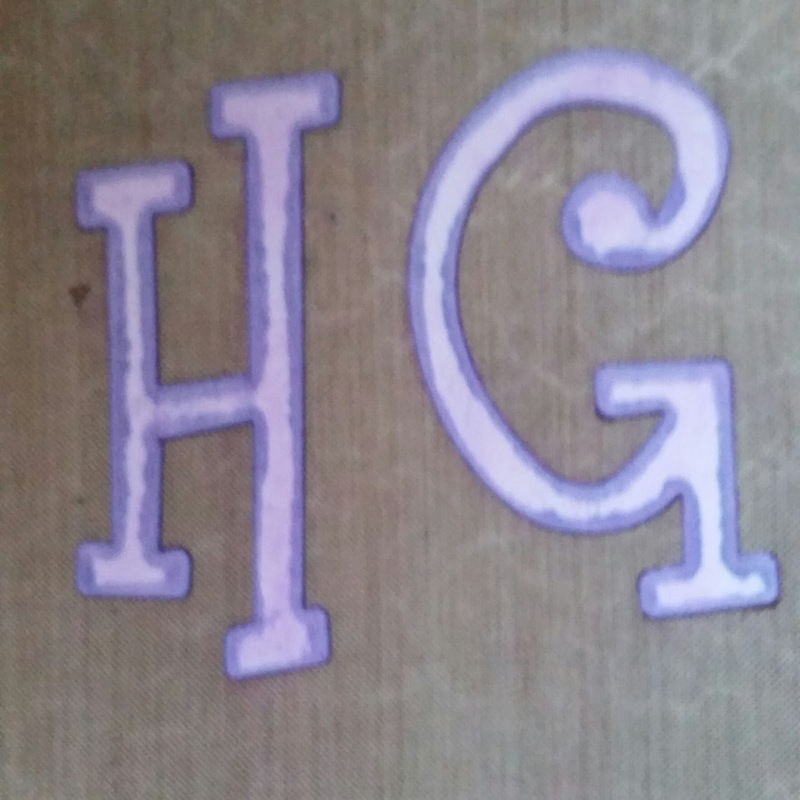 I needed the letters HG in a large font in purple however I didn't have a die big enough and the only letter stickers big enough were white so I decided to colour them. First I rubbed Distress Stain Shaded Lilac on the letters and wiped off the excess. It absorbed into the edges which gave a nice effect. Then I sprayed with Dylusions Spray Crushed Grape and wiped off the excess. I wanted to show what HG meant so I typed up some words that are associated with HG and the wording regarding the difference Intravenous Fluids make to a patient in purple and printed them out. I put the date of her being sent to A&E by her GP and her discharge date on a tiny tag and the date she reached 8weeks on another tag. As I live 3.5 hours drive away I didn't get to her until she had had 2 days of fluids (the day she reached 8 weeks) as hubby had to arrange shift swaps so he could look after the kids and we had to figure out how to get me down there without taking the car, so the first photo is after 2 days of IV fluids and life saving medication. If you haven't heard of Hyeremisis Gravidarum please make yourself aware of it, it affects 2% of pregnant women and can be fatal. Awareness is essential so more women who are suffering can get the treatment they need. So often we are fobbed off and the diagnosis is missed. Please don't tell a woman who has HG to try ginger, or crackers, seabands, etc. Everything that may help normal morning sickness has little to no effect on someone with HG and for many can actually make it worse. Please don't tell a woman enduring HG to not take her medication, the medication is keeping her and her baby alive. I now know this is what I had while pregnant with my eldest, despite gaining 13kg between 16weeks and full term my postbirth weight was 25kg less than my prebirth weight. My daughter lost 12kg in 4 weeks, but thankfully has not lost anymore weight, though her weight has not gone up despite a growing baby bump.